Vegan meringue….really? Yep, that’s right, the crispy base, the tangy curd in the middle and the soft, marshmallow-like top. It’s all vegan and it’s amazing. This is the perfect dessert to keep everyone excited after the main course. Wow, I never pictured myself baking a vegan version of lemon meringue pie, one of my favourite desserts of all time. Something I would like to do is try the original recipe and this recipe side by side because as far as I can tell, the curd and the pastry are very similar. The only noticeable difference is that the pastry was a bit crispier. But again, taste wise, I don’t think you’ll notice a big difference. It’s the meringue that will spark a curiosity in your taste buds. I am actually finding it difficult to describe the flavour, it just has that bit of savouriness about it. The texture is also a bit different in that it has a slightly looser consistency, but it caramelises the same way normal meringue does. I suppose “is it good?” Is the biggest question on your mind. And to that, I would say yes, absolutely! I really enjoyed it and it works really nicely with the curd and the base. And it’s definitely something I want to experiment more with in the future. How did you make the curd and how do you get it to set? Well, getting a sweet lemony flavour isn’t really the challenge, because you just add sugar and lemon. The real challenge is achieving a mixture that thickens and sets nicely. My first thought was to use gelatine but of course, as I always forget, that is made from animal bones. After doing some research I suddenly realised that not only is it easy, but I think it’s easier than making curd with eggs. I added arrowroot starch (which is a fantastic thickening agent) and that thickened the mixture up really nicely, but I also used a bit of vegan gelatine to make sure it would be set enough. If you find yourself struggling to find these ingredients at a supermarket, go to a health food shop and you should find them without any problems. People also like to use agar agar, which is another vegetable-based setting agent. So feel free to use that too. How on earth do you make the meringue? 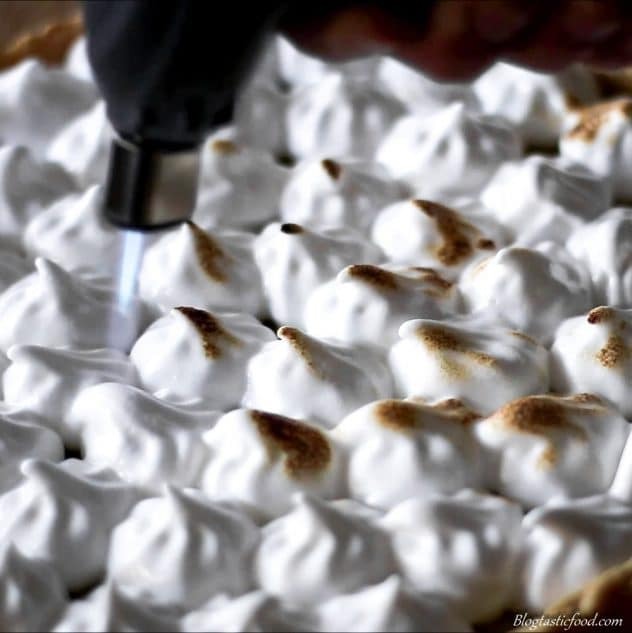 There is a little thing called aquafaba. And if you’re a vegan, you probably know a lot about this already. So……what is aquafaba? It’s just the viscous liquid you get from a tin of chickpeas. The liquid is even somewhat similar to egg white in that it’s clear, thick and slimy. And yes I know, that doesn’t sound all that appetizing, but once you start beating this liquid, you will eventually start to see a stiff peaks form. And it looks and feels pretty much identical to the normal meringue. All I did after that was add some crème of tartar just to stabilise it a bit, and I added icing/powdered sugar. I like adding powdered sugar to meringue because I find that even refined sugar takes extra, unnecessary time to dissolve through. And it’s that simple!! From there you can either pipe your mixture on the tart or just slap it on top if you’re not fussy. If you have any other questions about vegan meringue, feel free to leave a question in the comment section below. What if I don’t have a blowtorch? Just leave it, caramelising the meringue is just a little bonus, but it’s still really nice when it’s un-torched too. Just a bit lighter and fluffier. However, if you really want to caramelise the meringue you will have to go buy a blowtorch, there really is no other way. I highly recommend buying one at a kitchen shop rather than some kind of hardware store. The first blowtorch I got was from a hardware store and it was made for multiple purposes. The flame was really big and didn’t really seem to suit a kitchen environment. When I got my second one at a kitchen shop, it was lighter, easier to use and the flame wasn’t so big. So you get much more control over how much caramelisation, how much of a sear, how much of a crust etc. you want. Make this vegan lemon meringue pie in advance because it does take time. Once the curd was transferred to the tart base, I put it in the fridge to set. I kept checking every hour or so and I found that is was best to leave it to set overnight. 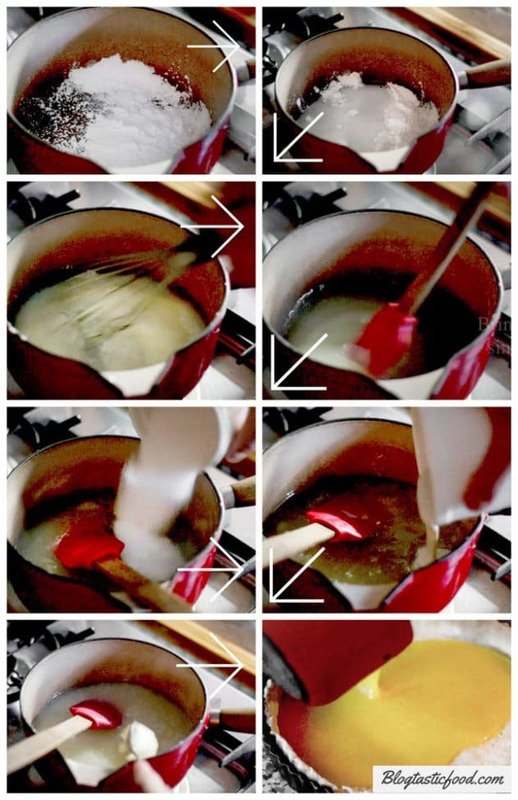 Here is what the process of making the base, and then adding the curd looks like. This is not a dessert you want to rush. So make sure time is in your favour before making this recipe. Oh, and read through the recipe before making it. Thanks so much for visiting my blog and checking out this post. If you decide to make this vegan lemon meringue pie, I really hope you like it. If you want to stay updated with new recipes, please feel free to subscribe. And if you like this vegan alternative for lemon meringue pie, you may also like this Vegan Potato Gratin I recently made too. The vegan alternative to one of my favourite desserts of all time. Crispy, Tangy, soft and sweet..yum! Pinch the margarine and the flour together in a mixing bowl until you get a breadcrumb consistency. Add the water and sugar then mix through, and firmly bind together into a pastry. Wrap in cling film and rest in the fridge for 20 mins. Meanwhile set up a tart case (I used a removable one but n a non-removable tart case is fine). Grease it with some of your extra margarine, then coat in a dusting of flour, making sure you shake off the excess. Dust a flat clean surface with flour and unwrap the pastry. Roll the pastry to about 2-3mm thick (be delicate). Dust the pastry and the rolling pin whenever the pastry starts to stick. 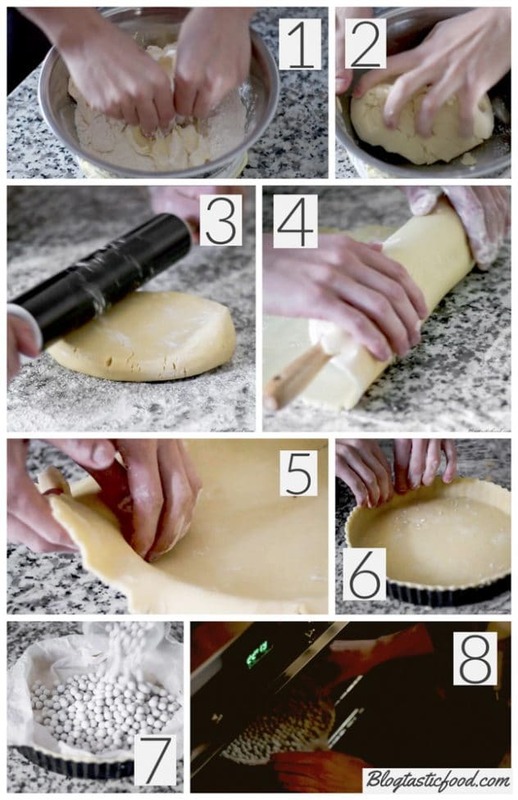 Roll the pastry up on the rolling pin, then drape over the tart case, carefully folding the pastry in the corners making sure the pastry is snug in the case. Trim and pinch the edges to neaten it up. And pre-heat oven to 160 degrees C (325 degrees F). Prick a few holes in the bottom of the pastry with a fork, then wrap the case with cling film and rest in the fridge for another 20 minutes. Unwrap the pastry, then get a piece of baking paper, scrunch it up and soak it in water. Squeeze out the excess water then put it over the pastry in the case. After that, add your baking beans or your rice to weigh the paper down. Bake in the oven for 20 minutes. Remove the beans and paper then cook for another 25 minutes. Whisk the arrowroot starch, vegan gelatine, water and lemon juice in a bowl until well combined and there are no lumps. Put in a pot, bring to a boil, then turn the heat down to a simmer. Add your sugar and stir through. Add your coconut cream and bring to a simmer again. Take the margarine out of the fridge and then add to the simmering curd bit by bit combining well on each addition. Finally, add a tiny drop of yellow food colouring (be very careful to not add too much). Turn the heat off then transfer the curd into the pastry case (do this before the curd sets). Leave in the fridge overnight to set. Put a sieve over a large mixing bowl, then drain the chickpeas (the chickpea liquid is what you want). Put the chickpeas in a container and store away for another day. Use an electric beater to whisk the chickpea liquid for about 5 minutes until you get stiff peaks. Sift in the crème of tartar and your icing sugar. Beat again until well combined, glossy and holding it's shape well. 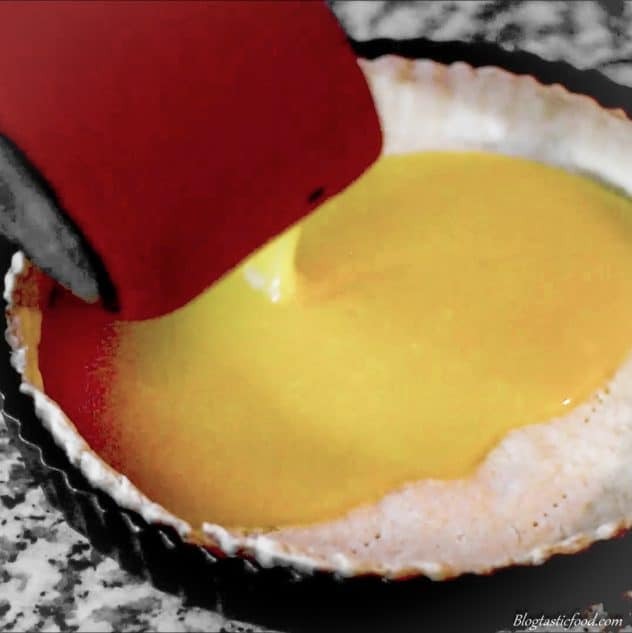 Fill a piping bag with the meringue and pipe over the lemon tart. Or just spoon it and spread it over the top. 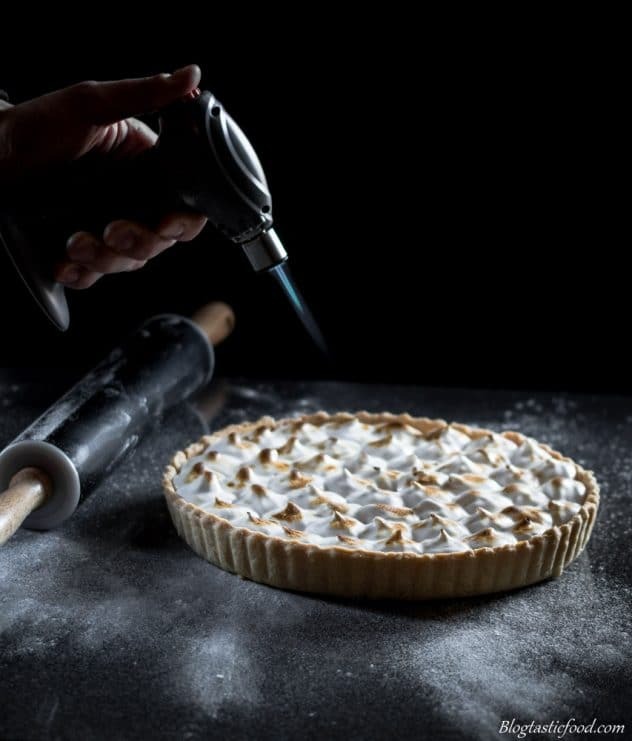 If you have a blow torch, use it to brown and caramelise the meringue. Remember, the curd should be set overnight, so make sure you have plenty of time to make this recipe so that you don't stress out. If you don't have a blow torch, just leave it, it will still be great. I might actually be drooling after reading this. I love lemon desserts!!! So excited to try this soon! Thank you so much Kamini!! Thanks!! Yes it’s super cool how you can make it vegan! The Meringue looks so perfect , great work. wow how creative and so pretty to serve such a delicious pie. Lemon meringue has always been a favorite here. This is just perfection! Beautiful! Nice to have options to serve for my vegan friends. I’m often confused by what’s a good dessert, so end up serving fresh fruit. While that’s safe, it’s not elegant like this! I love lemon tarts and especially lemon meringue pies. This is so beautifully done. Love how well you have explained the recipe. I’m not vegan but I do love the flavors and ingredients you have hear. Saving for later. Vegan meringue! Wow!! I have heard a lot about aqua faba but never ventured to experiment with it.And using arrowroot powder as a thickening agent is such a clever idea. I don’t use gelatin, so will follow your tip of using arrowroot powder and agar agar. My Mom is a big fan of lemon meringue. 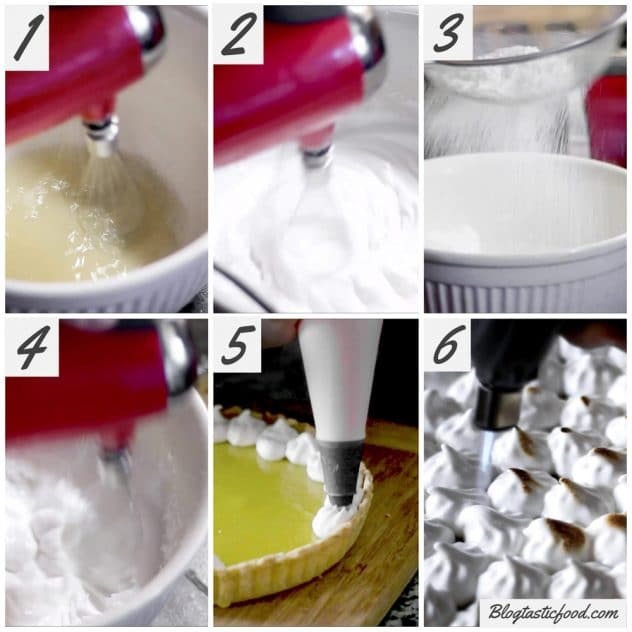 Your lemon meringue pie looks as good as some that I’ve seen in stores. This looks absolutely fantastic. I love lemon pies. You’ve made it looks so easy to make. I love the trick with wet baking paper 😀 So need to try that! Lemon Meringue is one of our favourites. Love using the blow torch to make that wonder browned topping. This looks totally delicious. Thank you so much!! Has been a favourite of mine too!! Thanks so much Veena! It really is amazing how close your can mimic a lemon meringue pie by making it vegan. And even if you’re not vegan, it is still wonderful! Well, Nicolas you’ve really created quite the recipe. I love lemon meringue pie but never thought it could become vegan. It looks beautiful and I’m quite envious — I’ve always wanted a blowtorch. I love lemon desserts!!! meringue looks really fantastic. Oh my God! This dessert looks absolutely amazing! Il one that vegans have so much more availability and diversity in our diet than in years past. Lemon Meringue is my favourite holiday dessert!! We actually have 2 vegan eaters in our mix at holidays and I often struggle with what to make that would keep everyone happy so I am adding this to my recipe box now! 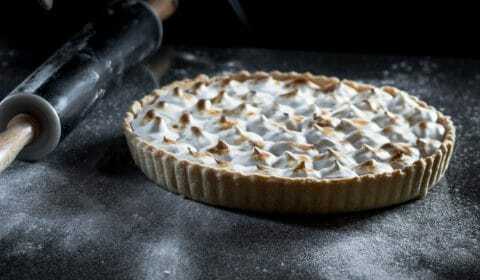 This lemon meringue pie looks delicious you made perfect crust and filling love the way you bow torched them. I need to get blow torch that will be my new kitchen gadget in my list to buy. Thank you Karyn! Definitely something worth trying. It blew me away too! I hope your vegan friends like this pie as much as I did. This vegan pie is outstanding! I’ve recently just discovered how delicious vegan meringue is and let me tell you, it’s become one of my favorites now to top on pies and cakes. I love how easy it is to make too. Fabulous dessert. Pinning! Thanks Nicolas, I am sure they are going to love it!! I love lemon meringue pie! So yummy and perfect for summer! What a beautiful, spectacular dessert! 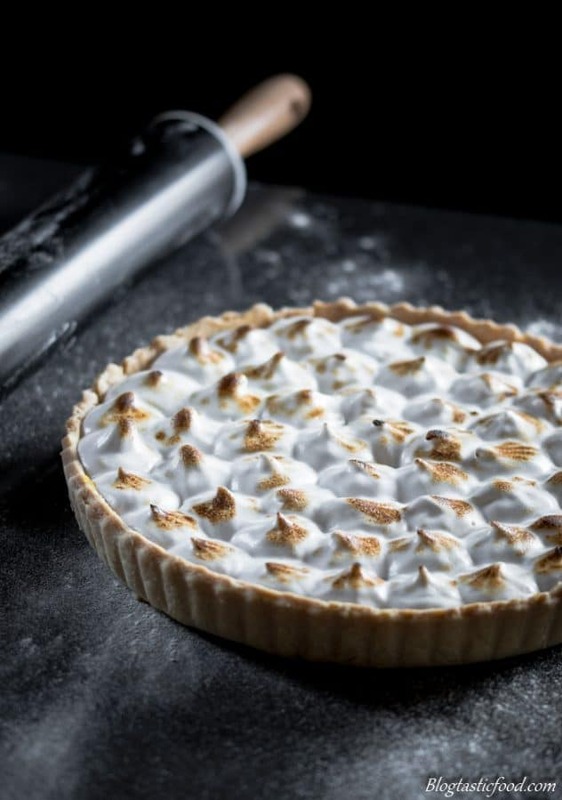 Your images of this Lemon Meringue Pie are stunning. I want to reach through my screen with a fork and dig right in! Mmm! 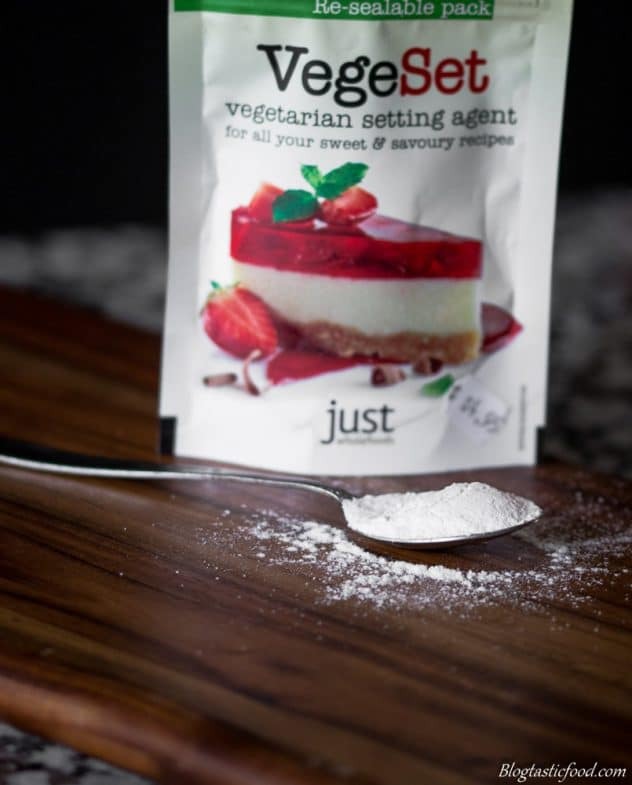 This looks fantastic 🙂 I’ve never heard of VegeSet before – definitely interested.